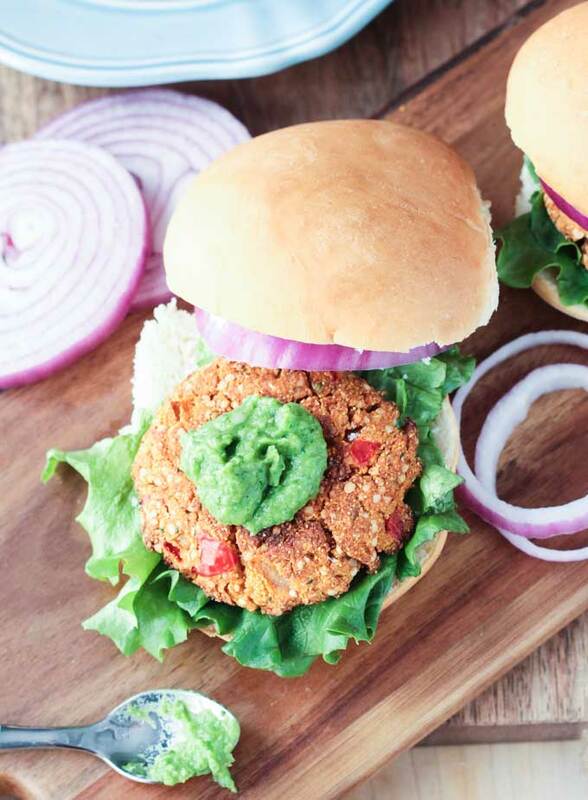 Celebrate vegetables with these Portobello Sliders from Love & Lemons Cookbook – they could not be easier! Keep reading for the recipe plus a review of the cookbook and a giveaway! 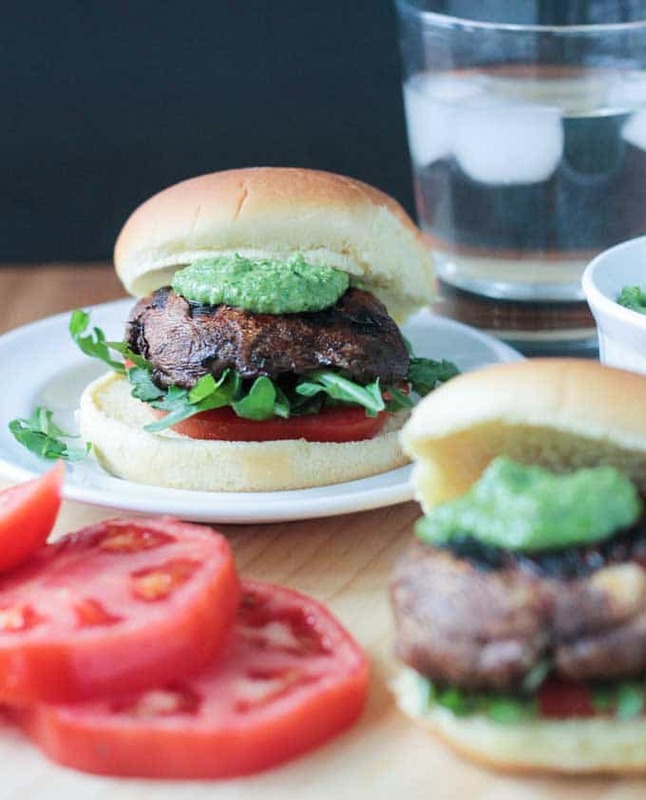 These Portobello Sliders might be the easiest “burger” you ever make! 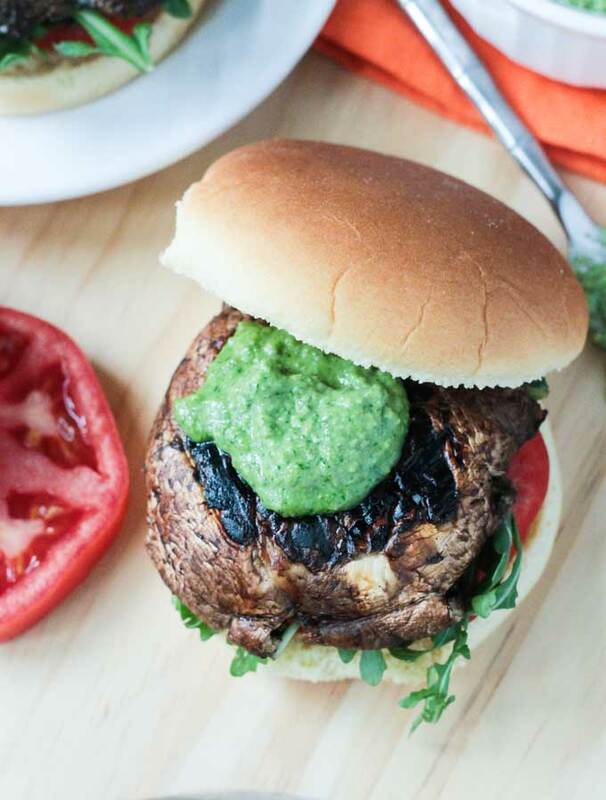 Portobello mushrooms are basically nature’s veggie burger. They are meaty and juicy, filling and flavorful. I inhaled two immediately. You can even throw them on the grill and they won’t fall apart. Perfect for an easy weeknight meal or the summer BBQs that are sure to be happening in the coming months. 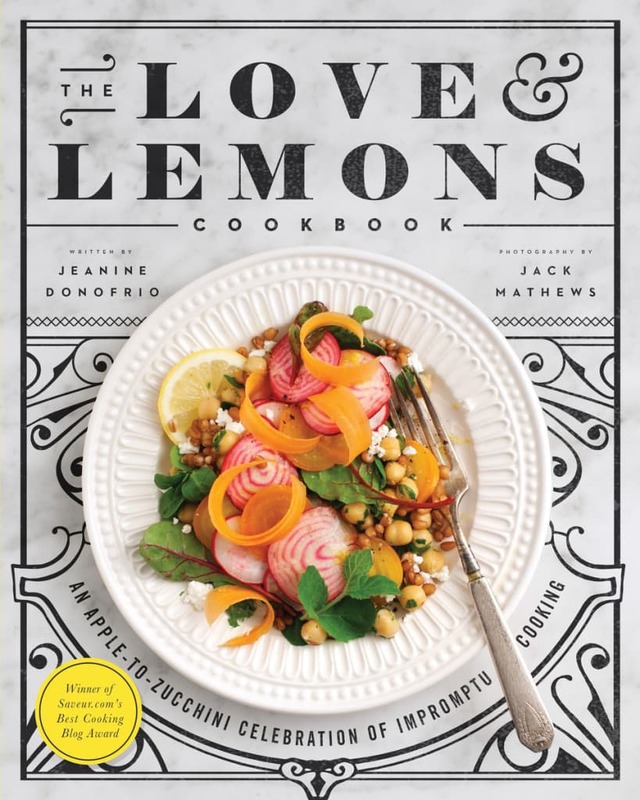 This lovely recipe is from the new cookbook, Love & Lemons by Jeanine Donofrio. So read on, friends, to learn all about this cookbook, get the recipe for the Portobello Sliders, and find out how you can enter to win your own copy of Love & Lemons. There are so many things I love about this cookbook! First and foremost, it’s a celebration of vegetables (and fruit too!). All the recipes are vegetarian, with almost all of them being vegan. Jeanine gives options for making the recipes vegan and/or gluten free if they aren’t already. The photos (taken by Jeanine’s husband, Jack Matthews) are big and bright and not only does every recipe include a photo, but there are additional photos of the vegetables and fruit themselves. So pretty and inspiring. Which leads me to the second thing I love about this book. The chapters are categorized by ingredient, not by course, and she even tells you which season(s) the particular vegetable or fruit can be found. Personally, I think this is brilliant because how many times have you bought something at the grocery store or farmers market because it looked good or you know it’s healthy so you wanted to try it, but then you get home and think, “Now what do I do with it?” Well, now you don’t have to wonder, just flip to that particular ingredient chapter and take your pick. Instead of starting with a recipe and then heading to the store to buy all of those particular ingredients, she gives tips on how to create something great by first choosing what you already have on hand and then adding to that. No more wasted veggies at the end of the week! She includes a handy 2 page spread of fridge and pantry essentials to keep on hand at all times. Jeanine says, “Lemons, limes, and vinegars will really bring your food to life.” You don’t have to tell me twice – I could drink those things! Speaking of handy resources, included towards the back of the book are “How-To” recipes – like how to cook millet and quinoa, and how to toast nuts. You’ll also see recipes for sauces and dressings that you’ll find yourself using time and again. And, that’s not all, Jeanine also teaches you how to make variations on smoothies, salsas, pestos, and guacamole – again making it super easy to create delicious food without having to run out to the store for specific ingredients. 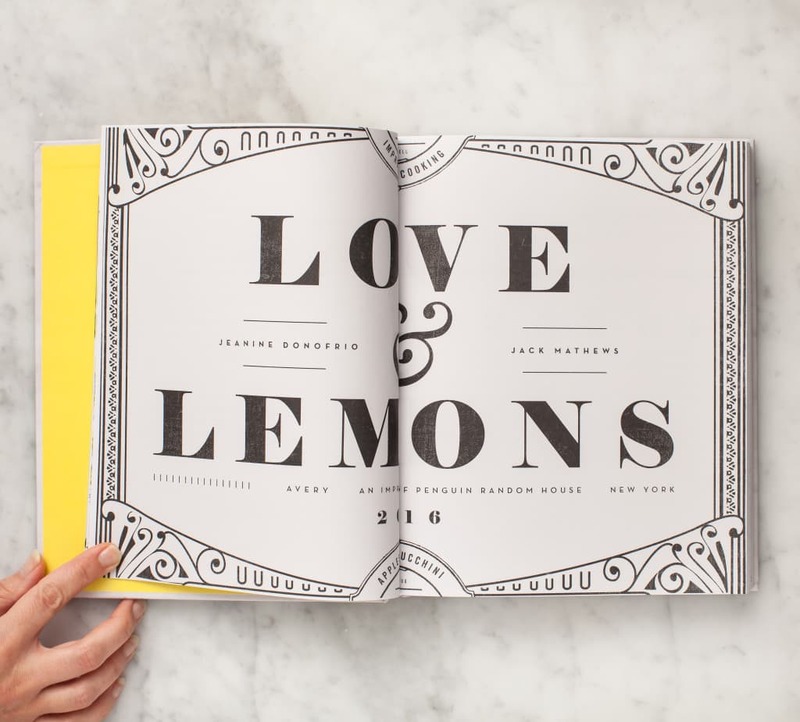 Love & Lemons is not just a cookbook, it’s a teaching tool as well! Ok, one last thing before we get to the GIVEAWAY so you can enter to win your own copy of this cookbook that you will no doubt use all year long. 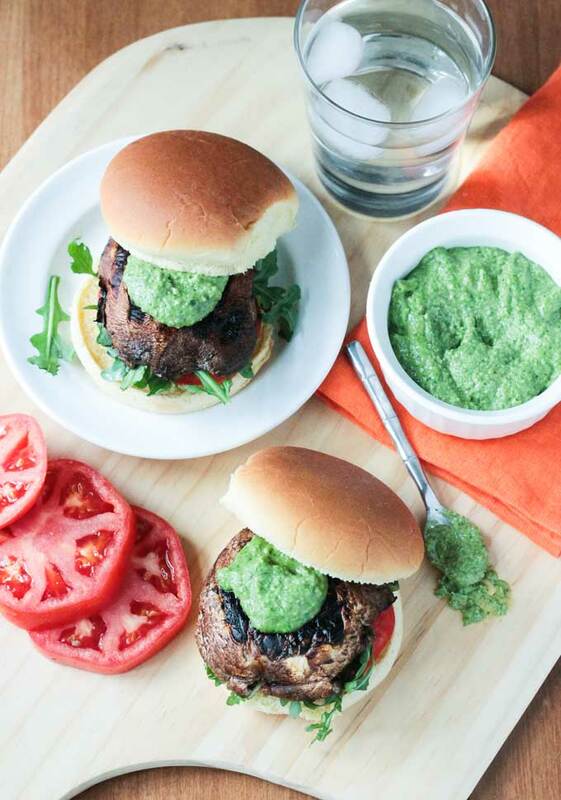 And it’s the recipe for these Portobello Sliders that Jeanine and Avery Books were gracious enough to let me post for you. Make them for yourself – so easy, so delicious! 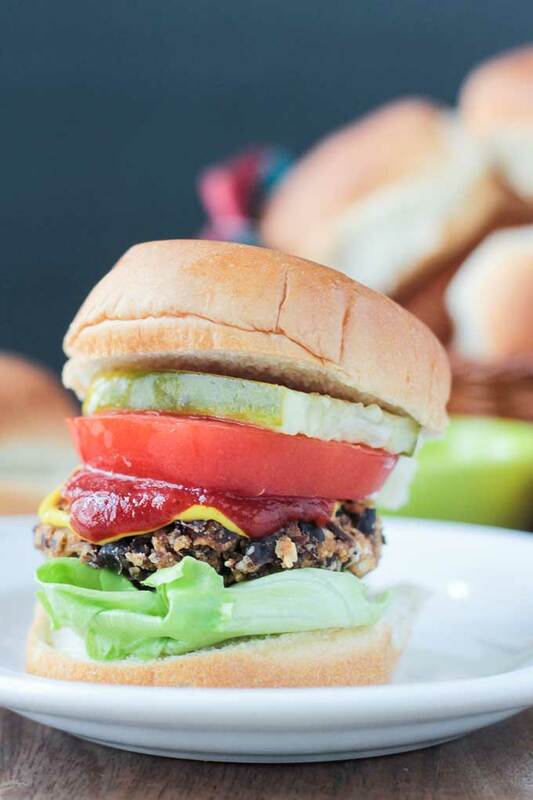 Jenn S. says, "Quick and easy and celebrating big beautiful vegetables, these Portobello Sliders are a must try!" Prepare the mushrooms by removing the stems and cleaning the caps with a damp cloth or paper towel. Place the mushrooms, gill side down, on the grill or grill pan. Cook about 10 minutes per side, or until the mushrooms are tender. *Use wheat-free tamari to keep the recipe gluten free. ***Use your favorite pesto in place of the pepita pesto. Have to say my favorite veg is kale! Wow, that’s great! Super healthy! I knew I’d been here and drooled over these already. I included them in my 25 Tasty sandwiches to make lunchtime more exciting. Love it! Also stumbled, pinned and yummed. Oh, awesome! Thanks, Jac! I’ll check that out and share! 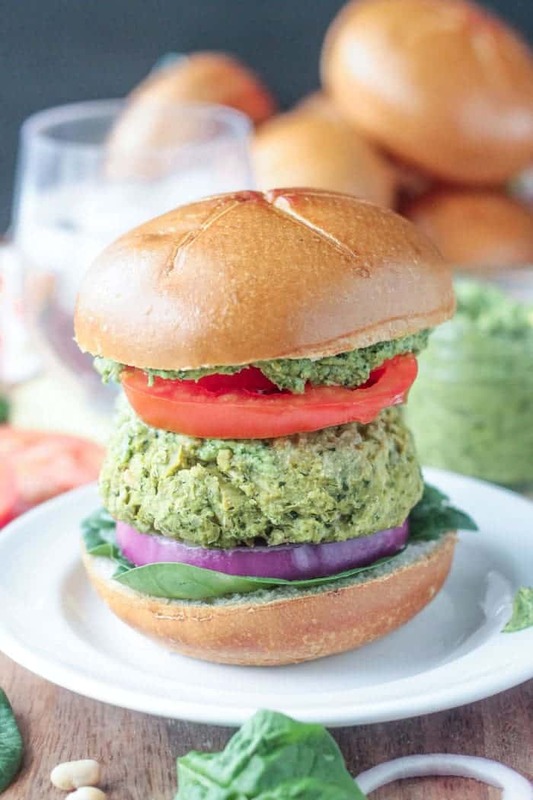 Love the title of this book and your slider sounds awesome, especially with the pesto addition. I’m in love with wild garlic pesto at the moment and seem to be getting through rather a lot of it! I think I remember seeing your wild garlic pesto – so yum!! Isn’t it pretty! The inside is just as gorgeous! Thanks, Cathy! In the spring asparagus is one of my favorites! It’s the best! I wish the season lasted longer. Me too, Corrine! I wish the season lasted longer! I love artichokes! So yummy. They are delicious! Thanks, Lydia! I would have to say broccoli! I’m so excited for your cookbook! It looks beautiful! I love so many vegetables but, my favorite is zucchini! I love almost all vegetables, but avocados are probably my favorite. Oh, good one! Yes, avocados are the best! 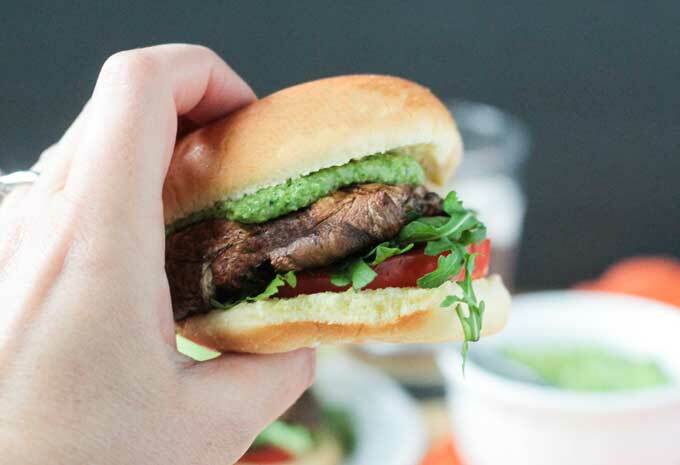 Portobello sliders are one of the first recipes that Alex and I put on the blog, it’s still one of my favorites. I love the philosophy of “backwards” cooking. That’s actually how I cook most of the time. I use what I have, it forces me to be creative. Thanks for the great review, Jenn, and your pictures are beautiful. Thank you, Linda!! I definitely the concept of “backwards” cooking is brilliant. And once you know how to do that, it makes dinner time so much easier!! It’s very intimidating for some though until they are comfortable with it. My favorite veggie is cauliflower. I used to hate it as a kid but nowadays I love it. It’s so versatile and there are so many things you can do with it. I love it steamed, riced, mashed….you name it. Yes, I totally agree! That’s my favorite veggie too! My fave changes all the time too! Good luck in the giveaway! What a pretty new cookbook, and I love the simplicity of this recipe. Thanks, Alisa. Yes, all the recipes are easy enough for even the most novice cook, but still creative and delicious! Thanks, Mel! You would love the book! Sounds like a wonderful book! I’m a huge vegetable lover period, but I’d have to go with potatoes, bell peppers and broccoli…no way I can pick one, lol! I know, it’s hard to pick! They are all so delicious if fresh and cooked right. Thanks, Brandi! It changes daily 🙂 but most of the time I can’t get enough broccoli! Thanks for the chance to win. That’s probably the veggie we eat the most too…my kids LOVE it! Thanks, Ashley, and good luck! Super hard to pick a favorite veggies but if I HAD to — cauliflower!! I love their blog so much! This book is definitely on my wishlist. What a gorgeous recipe! Me too! You will not be disappointed with this book! Can’t wait to hit up the farmers markets this summer and try some new recipes! I guess I like corn or carrots the best. We use a LOT of corn and carrots in this house! Yum! Good luck! Ooh this book looks just gorgeous! My favorite vegetable is broccoli. I’d eat it daily, if I could! We eat a ton of broccoli too. My kids love it steamed with nothing on it. They are easy to please! L&L is on my Amazon wishlist – it does look like such a great book! And this recipe looks sooo nom too, thank you for sharing it! Hi, Nicole! That might work. I would suspect a LOT of juice would come out of the mushroom that way though. If you try it, let me know! Hard to pick one favorite veggie! I go through a ton of spinach, though. Also, I think I am a backwards cook. Oh, that’s good! I’m sure you have less waste than most that way. Thanks, Caroline! 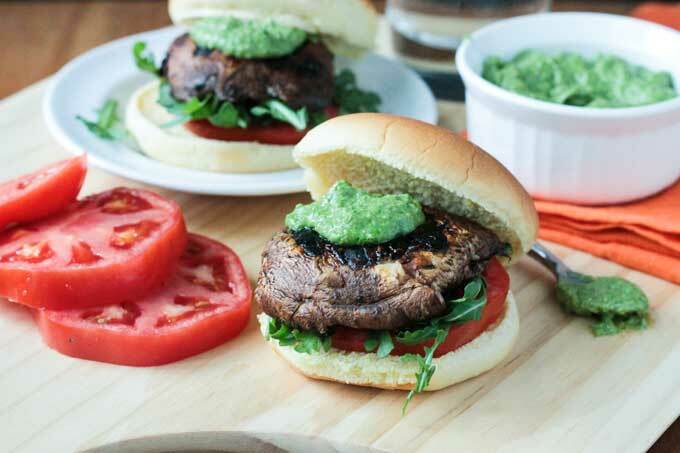 I remember the first time I made a portobello burger years ago…instant love! My favorite child changes by the day. 🙂 It’s SO hard to pick a favorite vegetable because I feel like that changes with the seasons. Right now, it’s asparagus, but overall it’s probably cauliflower. I love every vegetable but I would have to say my favorite is the potato. I’ve never met a potato I didn’t like!! Yes, potatoes rock! And they are super versatile too!! My hubby doesn’t like them, so more for me!! 🙂 Good luck in the giveaway! Thanks, Deanne!